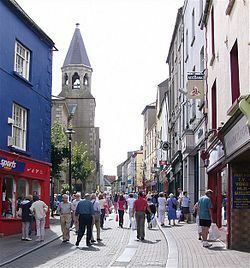 Wexford (Irish: Loch Garman; Yola: Weiseforth) is the county town of County Wexford, Ireland. Wexford lies on the south side of Wexford Harbour, the estuary of the River Slaney near the southeastern corner of the island of Ireland. The town is linked to Dublin by the M11/N11 National Primary Route, and the national rail network connects it to Rosslare Europort. It has a population of 19,913 (20,072 with environs) according to the 2011 census. The town was founded by the Vikings in about 800 AD. They named it Veisafjǫrðr, meaning "inlet of the mud flats", and the name has changed only slightly into its present form. "Veisa" in modern Norwegian means "Way". So 'Veisafjǫrðr' could have meant "inlet of the way" or "Way Fjord". According to a local legend, the town got its Irish name, Loch Garman, from a young man named Garman Garbh who was drowned on the mudflats at the mouth of the River Slaney by flood waters released by an enchantress. The resulting loch was thus named Loch Garman. Wexford has witnessed some major developments such as the Key West centre on the Quays, the redevelopment of the quayfront itself, White's Hotel and the huge new residential development of Clonard village. Proposed developments include the development of a large new residential quarter at Carcur, a new river crossing at that point, the new town library, the refurbishment of Selskar Abbey and the controversial redevelopment of the former site of Wexford Electronix. Also, the relocated offices of the Department of Environment have been constructed near Wexford General Hospital on Newtown Road. Notable churches within the town include the "twin churches" St. Iberius Church, Bride Street and Rowe Street with their distinctive spires; Saint Peter's College, with a chapel designed by Augustus Welby Pugin; and Ann Street Presbyterian church. A former Quaker meeting hall is now a band room in High Street. 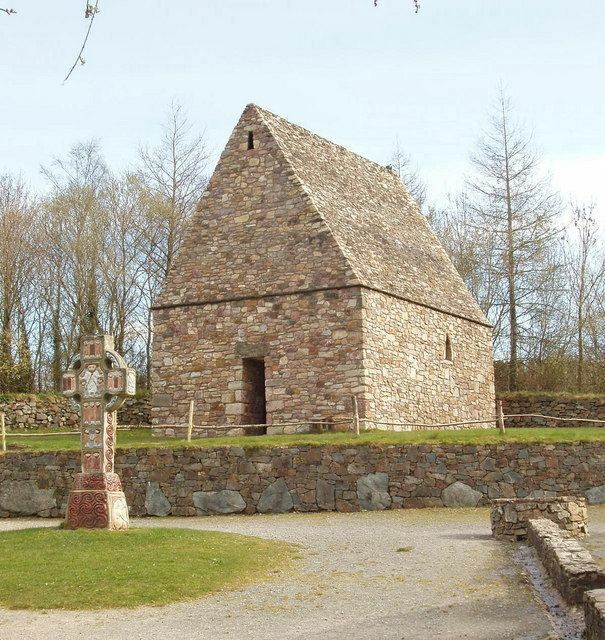 The twin churches can be seen from any part of Wexford and in 2008, their 150th anniversary were celebrated. In the early 21st century a new port was built about 20 kilometres (12 mi) to the south at Rosslare Harbour, now known as Rosslare Europort. This is a deepwater harbour, unaffected by tides and currents. All major shipping now uses this port and Wexford Port is used only by fishing boats and leisure vessels. From an employment point of view, major employers in and around the town are: Wexford Creamery, Celtic Linen, Wexford Viking Glass, Parker Hannifin IPDE, Waters Technology, Kent Construction, Equifax and BNY Mellon. Coca-Cola operates a research plant employing up to 160. Eishtec operates a callcenter for British mobile operator EE that employs 250. Pamela Scott, A-wear and other retailers operate in the town. Wexford railway station opened on 17 August 1874. The railway line from Dublin to Rosslare Harbour runs along the quayside on the north-eastern edge of the town. In 2010 the Rosslare Strand-Waterford rail services were suspended, due to budget cuts at Irish Rail. Wexford is also served by local and national bus networks, primarily Bus Éireann, Wexford Bus and Ardcavan. There are also many local taxi and hackney providers. Rosslare Europort is 19 kilometers south of Wexford. Car ferries run between Fishguard and Pembroke in Wales and Cherbourg and Roscoff in France. The ferry companies operating on these routes are Stena Line and Irish Ferries. Foot passengers can use the SailRail tickets from Wexford railway station via Rosslare Europort and Fishguard Harbour to reach Swansea, Cardiff Central and onwards including London Paddington. The Wexford football club was admitted to the League of Ireland in 2007. Wexford was the first Wexford-based club to take part in the competition. 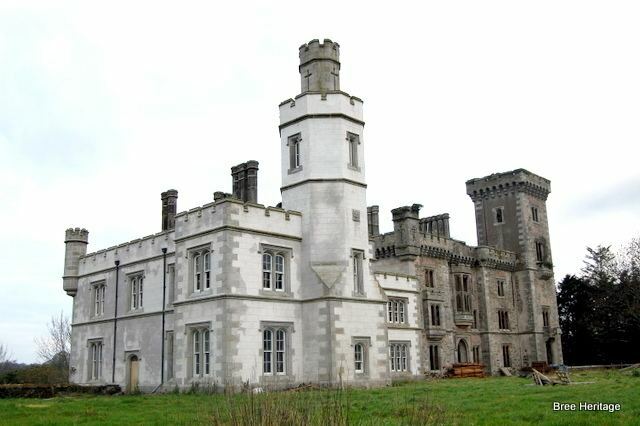 The club was the brainchild of former property developer Mick Wallace TD, who funded the construction of a complex for the new team's home at Newcastle, Ferrycarrig. In 2015, the team won promotion to the Irish Premier League. The club launched Wexford Youths WFC, a Women's National League team, in 2011. Wexford had a brilliant hurling team in the 1950s which included the famous Rackard Brothers, Nicky, Bobby, and Willie, Art Foley who was the goalkeeper, Ned Wheeler, Padge Kehoe, Tom Ryan, Tim Flood, Jim Morrissey, Nick O Donnell, to name but a few. Wexford has one rugby club, called Wexford Wanderers. New developments are in planning in the educational sector (2016) and construction is under way for both the boys secondary school Coláiste Eamon Rís, Loch Garman - C. B. S., Wexford (for boys), and for the girls secondary school Loreto Secondary School, Wexford (for girls),. The other schools in the Wexford town area are St Peter's College, Wexford (for boys), Presentation Secondary School, Wexford (for girls) and Selksar College S. C. (mixed).